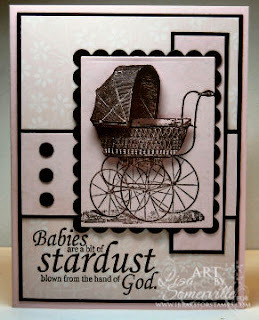 I just love pinks and browns, and thought it would make the perfect baby card using the Antique Buggy image from I Brake for Stamps and the SCS SC215. I rotated the sketch and made one of my panels slightly thinner, but that's what nice about the sketches - taking a few creative liberties! The main image was stamped in Jumbo Java Ink, then cut with my Rectangle Nestabilities. Then I stamped the image several more times and cut different sections of the buggy and popped it up on dimensionals. The scallop rectangle was also cut using the Nestabilities. 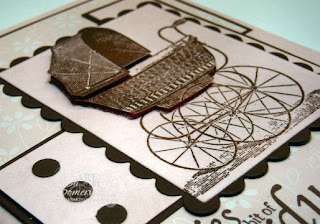 I used my SAMJ to stamp the sentiment on my Candy Lane DSP. Love the 3-D on the buggy. thanks for sharing, so pretty!! The 3D effect really makes this card extra special! Beautiful! WOW, that is gorgeous!!! The buggy is awesome!!! This is outstanding Lisa. Love the muted tones for this vintage buggy...and what dimension! WHOA...fantastic!